Contestants in a giant game where players roam London shooting each other with water pistols risk committing criminal offences, police have warned. Street Wars is a three-week contest in which players are given the name, address and a picture of a target. Their aim is to hunt them down and squirt them with water. They say it is just a bit of fun but police said players were irresponsible as some water guns look real and could lead to armed police being deployed. The game which, according to its website, has been played in New York City, Vancouver, Vienna, San Francisco and Los Angeles, began in London on Tuesday. British Transport Police said: "The sight of people carrying what appears to be a firearm on the London Underground system one year after the tragic events of July 2005 will cause passengers and staff genuine fear. "Calls to the police may lead to disruption to services and the deployment of armed officers. Any offences committed will be treated seriously." 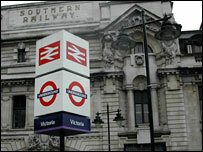 Supt Bob Pacey advised contestants to stay away from the London Underground and rail system. Scotland Yard added that a seemingly innocent bit of fun could result in a waste of police time and divert essential resources away from real life. So far there has been no response from the game organisers about the police's comments. But one contestant, a research assistant who would only call herself agent X, said: "Something like this is just a bit of fun. We are not trying to terrorise other people. "Everyone who is in the game, knows what is going on." But extreme sports consultant Andrea Aird said the game should take place in a contained environment rather than on the streets.